Wrapped In Love: Painting my world….. 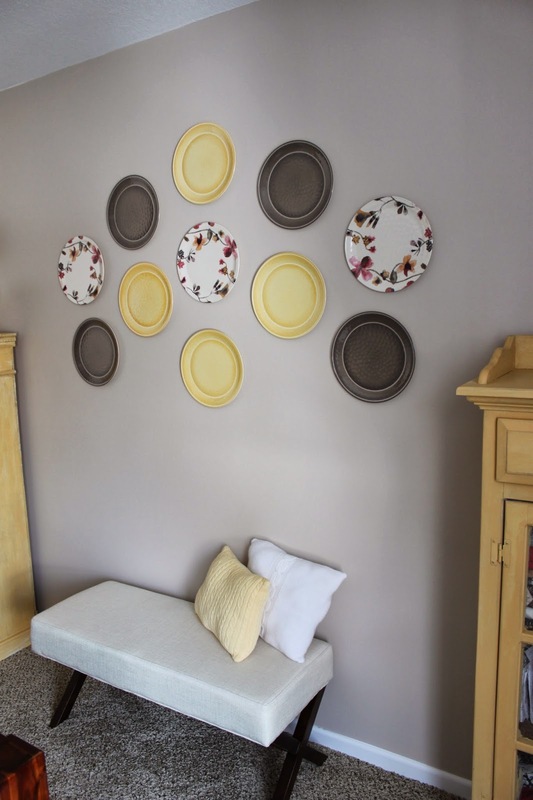 Finally got my plates on the wall to give the finished look of the dining room…. the spot below looked empty so I thought a bench would make it warm and inviting… went to GW found some sweaters (darn Pinterest) washed the sweaters for making a couple of pillows (yes they are lumpy I need to sew the stuffing into some fabric then put inside the pillowcase). Decided I would finally complete the Burlap Wreath I started a few months back….. So here it is…. AND one thing leads to another… onto the family room where I have navy furniture…. The table I have behind my navy leather sofa is getting a makeover. While I like patriotic I am not going for the patriotic look in the family room, I am going with Gray (the new neutral) , Red and Navy I think I can make it work! Stay tuned, this program will be interrupted for an awesome day with my grandkids!